The twenty economies among the nations of the world are working to come up with a solution to the global economic crisis that is a danger to all nations of the world and many of these national leaders accuse the US economic policy of causing more harm than help. China and Germany lead the attack on the United States economic policy that calls for dumping more dollars with no monetary value into the United States marketplace saying it will not solve the problem and bring economic problems to other nations. At the top of the agenda at the G-20 meeting is a discussion on two issues; a global structure to solve the worldwide economic crisis and the development of a one world economy. The work of the G-20, the world's leading economies, is in reality setting the stage for Bible prophecy to be fulfilled as they work for a resolution to the present global economic crisis. 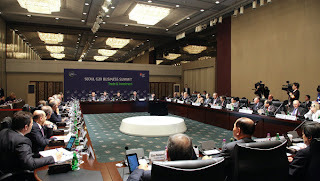 The gathering of the top twenty economies of our world in Seoul, Korea is a forum where the leaders of these top twenty nations realize the danger of not fixing the present global economic crisis. US President Obama's economic policies have come under fire and both Germany and China say that if America continues as they are, it could affect the entire world economy with disastrous results. The discussion of a worldwide economic structure to solve the crisis and the introduction of a one world currency - both on the agenda of the G-20 meeting - has a very close connection to the end of times scenario that can be found in Bible prophecy. In the last half of the 7 year Tribulation period the Antichrist, the world dictator at that time, will set up his economic plan and headquarter its operation in the literal city of Babylon (Revelation 18). Biblical Babylon by the way is modern-day Iraq which has been so much in the news. This Antichrist will make all people on earth to take an identification on their forehead or the back of their hand in order to be able to buy or sell even food stuffs needed to sustain life (Revelation 13:16-17). This global economic crisis that now faces our world is the precursor for people taking the mark of the beast and is indeed setting the stage for Bible prophecy to be fulfilled.